Welcome back after the break. Guess you are all geared up to continue with our features exploration. So, here we go! Playback Speed: Allows controlling the execution speed of the test case/test suite selected. Play entire test suite: Allows playing the all the test cases belonging to a test suite sequentially. Play current test case: Allows playing the test case that is currently selected in the test case pane on the left. Step: Helps to step into each command in the test script and allows executing only one step of the test case at a time. This comes handy while debugging the test. Rollup: Allows combining repetitive sequence of Selenese commands and execute them as a single action. It is an advanced functionality of this tool. Test Scheduler: Allows us to set rules for scheduling tests according to our needs. This option can be turned on or off. 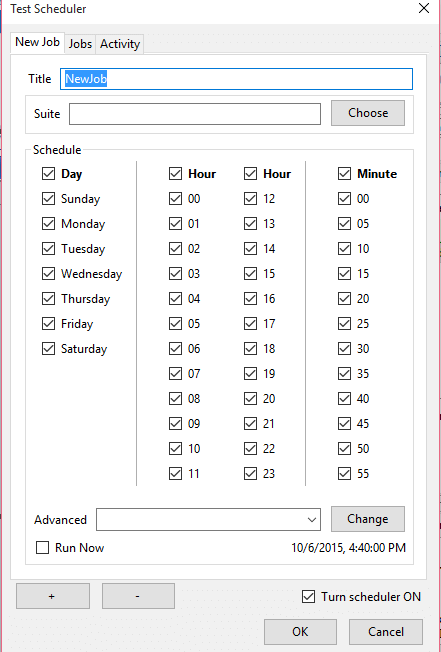 Clicking on the icon will pop up ‘Test Scheduler’ window as shown above. Title for the job can be provided. Day, hour, minutes can be chosen by clicking appropriately. Advanced options such as every hour, every 5 minutes etc. are available. Record: This is used to start/stop the recording of the user’s browser actions. Each action is entered as a Selenese command in the test script pane which is in the center. A hollow red circle indicates that the tool is recording and a solid circle as shown here indicates the end of recording. By default when IDE is launched, it is in recording mode. It shows the number of test cases opened currently. The currently selected test case is shown with a bold font. More than one test case can be opened. Opening a test suite will automatically open and list all the test cases associated with it. Once these tests are executed, they are color coded. 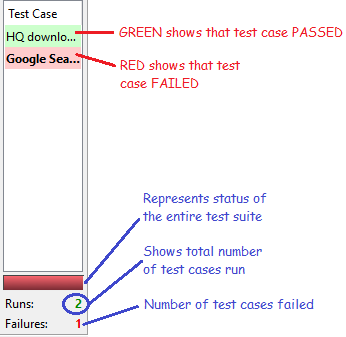 Green shows that the test case passed and red shows that it failed. Test results are displayed at the bottom. The color in the bar represents the passed/failed status of the entire test suite. Total number of test cases run and the number of test cases failed are also indicated. This section displays the script of the test case that is recorded. Each action will be recorded and displayed in the same order as it was performed on the browser. There are two views viz. 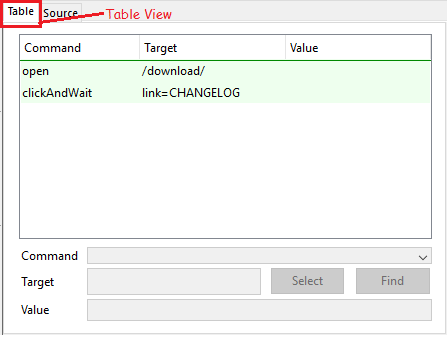 table view and source view. This is the default view which will be opened when the IDE is launched. It shows the commands along with its parameters in a readable tabular format. Each step is color coded with either green or red as the test case is executed. Commands can be inserted and edited with the command/target/value section below. An entire blog has been dedicated to cover this part. This shows the format in which the test case will be saved. By default HTML format is displayed. Other programming languages such as C#, Java, Ruby, Python can also be selected with the help of Options tab in the menu bar. Source view also helps in editing the scripting in its native form along with cut, copy and paste options. This pane has four functions. Based upon the tab chosen, its corresponding function is performed. This is the default pane displayed even if log tab is not selected. Information and error messages are shown in runtime as the test case is executed. These are used for debugging the test case. The clear option is used to clear the logs generated thus far. Info option is a dropdown with four choices of selection – Debug, Info, Warn and Error. Particular level of messages can be filtered by selecting our choice of logging level. An example with error messages being filtered can be seen below. Info: Provides information about the command that is currently executed. Warn: Displays warning messages in rare situations such as invalid parameters/ meaning less conditions etc. Error: Messages displayed when an error occurs during the execution of a test case leading it to fail. Errors are generated when a condition mentioned in ‘assert’ and ‘verify’ commands are not met as well. It shows the description of the currently selected command along with explanation for the required target and values. These images show the reference of the selected command, ‘clickAndWait’. This also is an advanced feature of the tool. Detailed information on this aspect is available in the same “UI-Element Documentation” option under Help menu. So in simple words, when repetitive sequence of Selenese commands are combined, it is known as ‘rollup’ in our Selenium world. This can be executed as a single action and these rollups are reusable i.e. it can be used multiple times, thus shortening the script length and making it more meaningful. 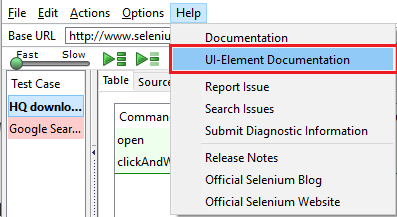 With that said, we have pretty much covered all the features, terms and sections of the Selenium IDE tool. Get a hold of it and you are all set to start automating your manual tests. 1 Comment → 7e. 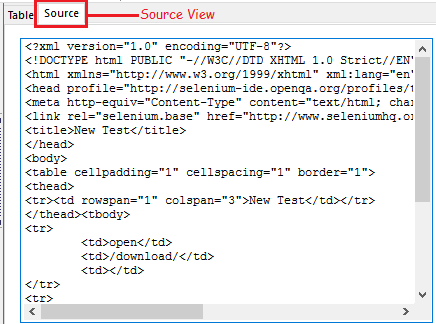 Selenium IDE – Know your IDE features Contd. thanks to your articles now i have a better understanding of selenium IDE and tools.